By Devika Garg, September 2015. We may have found liquid water on Mars, but the rest of outer space has none. This is why astronauts at the International Space Station have been drinking recycled water since 2008. In the uncertainty of climate change, surely we on Earth could follow their lead? In a bid to find an answer, Sustainable Silicon Valley (SSV) organized the Water Technology Symposium on September 16 at the Palo Alto Research Center (PARC), and brought together policy experts, technologists, business strategists and public communicators to find solutions, pin down hurdles, and discuss some successes in water recycling. The experts’ broad message was writ large – we already have sufficient technology to recycle water in a decentralized manner; all we need are more practical water reuse policies, financial incentives and more receptive users. From the left: Architect, Russ Drinker; Founder of Sherwood Design Engineers, Bry Sarté; Senior Building Ecology Specialist at ARUP, Kirstin Weeks; and New York Times reporter, Matt Richtel at the Water Technology Symposium held September 16, 2015 at the PARC Xerox Center, Palo Alto. California’s historic drought is now a national conversation, together with Governor Brown’s drought campaign. To most residents, it largely means having to live with a less than lush lawn. To many farmers, it means having to rethink crops in the face of restricted water rights. But reducing water use can only go so far; water recycling is the natural next step for long-term drought mitigation. 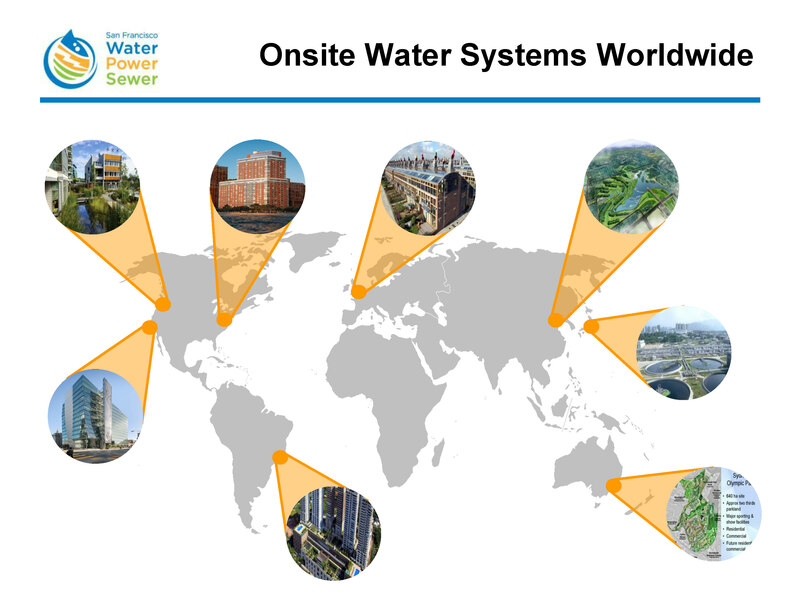 Centralized water recycling is one solution where wastewater is transported across to a central treatment plant, and recycled water is sent back out through a network of purple pipes. But transporting sewage and water costs energy and greenhouse gas emissions. Laying down a separate recycled water network is expensive, and so is retrofitting buildings. A cleaner and more efficient way would be for every building to recycle its own water. Simply put, on-site water recycling means recreating an accelerated water cycle in every building. The opening panel at the Symposium discussed how to integrate water design in residential and commercial buildings with three building designers, Architect Russ Drinker, Founder of Sherwood Design Engineers Bry Sarté, and Senior Building Ecology Specialist at ARUP Kirstin Weeks. The panel was moderated by New York Times reporter Matt Richtel. “About 80-90% water in a building is directly reclaimable,” said Kirstin Weeks. In this light, on-site wastewater management can be near-term and would drastically cut the costs of pipes to and from treatment plants. Decentralized water management simply makes more sense. Russ Drinker, who has designed smart buildings in Singapore and Saudi Arabia, pointed out that these countries along with Israel and Australia have had restraints on water availability. As a result, they have been racing with their water reuse technology, policy and implementation. Israel reclaims about 80% of their wastewater, Singapore almost a 100%. “Coming to the Bay Area, we should be the leaders; but we’re not. We’re behind the curve here,” said Drinker, as he urged California to look to these global examples. The good news is that we already have the technology to recycle water on-site. There are a number of different technologies for water recycling that work for specific high-density sites ranging from low-cost assisted living to luxury apartments. The Symposium Expo showcased tech companies in the business of on-site or district level recycled water, including the technology, water management, financing, and system operation that make it possible. That said, ROI timescales are not very favorable yet. “There is still a lot of room for innovation,” said Bry Sarté. “Anything we can do to bring down the cost of these systems is key,” he said. Architects are increasingly designing buildings bearing water in mind. San Francisco has introduced upto half a million dollars grants for developers to set up decentralized water. “Essentially you can control all the water that hits a site,” said Drinker, whose architectural designs feature rainwater and stormwater harvesting. A building can also recycle its greywater from the shower, dishwasher and laundry, useful for residential complexes. In addition, a building could recycle blackwater from the toilets, which makes most sense for office and commercial buildings; but that is where things get murky. The public bears a strong “yuck” sentiment towards using recycled sewage. 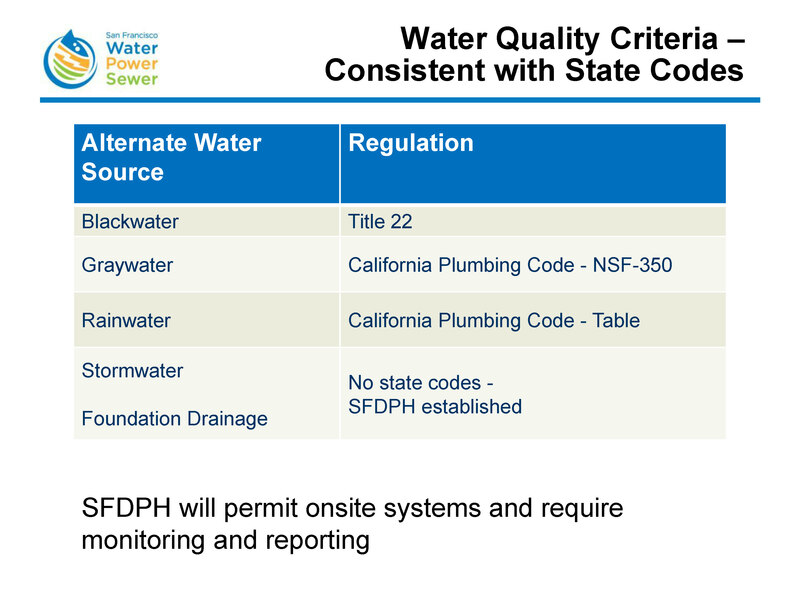 Current policy doesn’t help either – Title 22 of California’s water recycling criteria mandates strict quality control of recycled water for public health. “You have to submit daily samples for lab treatments, which is why it is usually not financially workable for some buildings,” Drinker said. Quality regulation is required, but daily monitoring is perhaps too much. “The water today has been recycled since the beginning of time. What’s important is not the source of water, but the quality of water,” Drinker pointed out to the audience. “There is a lot of contamination going into the regular water supply. 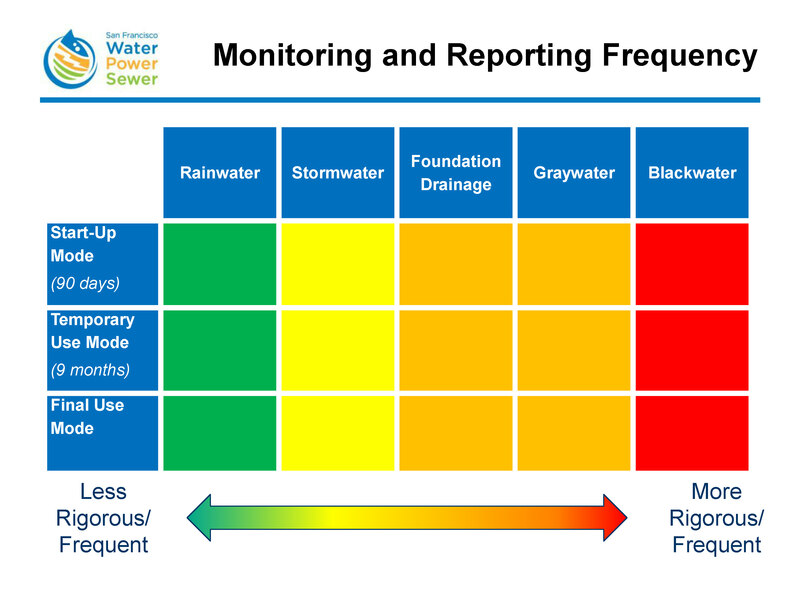 It’s good where people focus on clean water based on metrics, and be reasonable about it. No water is 100% pure, even if you go to an iceberg,” said Sarté. Public health is a priority, and the conversation on water quality has just begun. “People are going to become much more conscious of the quality of water that they currently have, and district water boards are going to be unhappy because the current water quality is not very clean,” Sarté said. Given the testing requirements, what is the scale of decentralization we can go to without adversely impacting public health? “I don’t think there is any technical or health issue for buildings to reuse non-potable water,” said Weeks. The good news is the bulk of water is used for non-potable purposes, which means savings could be huge. But Title 22 needs to be revised for that to happen broadly, the panel agreed. The ideal case would be to recycle all water to potable standards, and have a uniform system without purple pipes. Perhaps in the future, such direct potable water reuse could see daylight if a reliable low-cost standardized real-time bacteriological testing chip comes to the market. But many technology experts at the Symposium agreed that technology design itself should be rigorous and fail-safe enough to discount excessive operational monitoring, much like NASA’s water reuse technology. We’re very much behind on the adoption curve to recycle water in a systematic way. New high-density buildings are starting to integrate water design into the blueprint with help from companies like Aqualogic and Aquacell; but existing buildings are resistant due to financial constraints. Homeowners have the option to recycle greywater with Nexus eWater and WaterSprout, but these are largely early adopters who care about the environment more than the ROI. The government will have to work out financial incentives for more widespread adoption. The resounding message from the symposium was to use water that is fit-for-purpose. Drought or not, flushing gallon after gallon of potable water down the toilet does not make any sense. The good news is that climate change has generated new interest in addressing the marketplace, which could make it easier for policymakers and businesses to ride the wave of non-potable reuse. As for actually drinking recycled water, our friends in space are leading; it will take a while for the pale blue dot to catch up.